Last week in Sydney, we were fortunate to be rewarded for our hard work. The Indies (Independent Beer Awards), organised by the Independent Brewers Association, are judged by a respected panel of national and international beer judges are an invaluable platform for brewers to benchmark their beers and to showcase and celebrate excellence in independent craft beer. The Indies are an important platform to drive consumer awareness of the quality, diversity and excellence of independent beer. We were fortunate to walk away with 7 medals, including a coveted Gold medal for our entirely farm sourced Max Estate Ale. 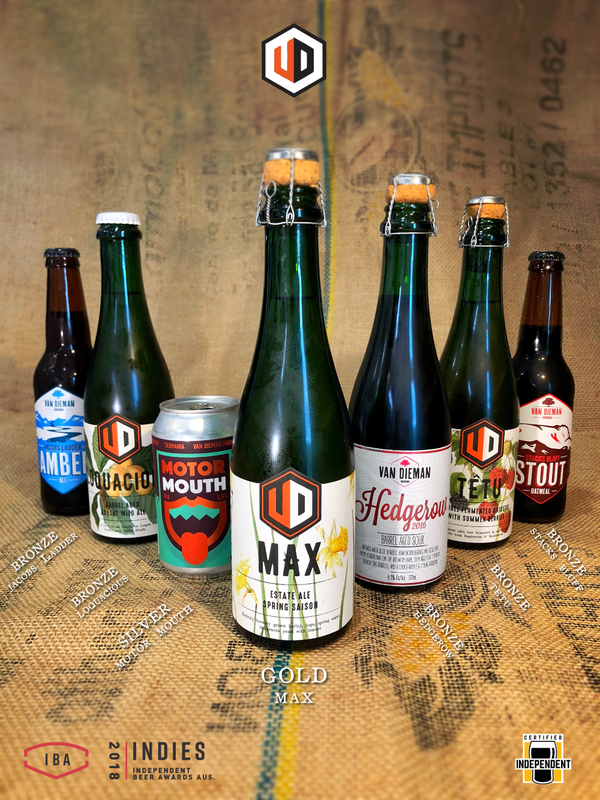 The quality of beers at the Indies were supreme, so we’re proud that from our little pocket in northern Tasmania were able to stand and deliver a beer like Max, and the other beers that were awarded medals. It shows the inherently close links to the land that beer holds, and that on our farm brewery we’re continually tying those links closer together. From a humble plan to grow, source and brew an entirely on-farm derived beer 3 years years ago, the reward this honour deliveries is immeasurable. Our ability to foster, create and harness the environment around us, and to deliver - first time around - a beer of the quality of Max is as much validation for our effort as it is confidence in where we constantly moving towards with our brewing and the beers we’ll offer. The culmination of this plan was realised when we created Max – a specialty Saison - crafted from hops grown in a hop field 200m from the brewery, barley from 300m away, water captured from a spring 400m away and an indigenous yeast selectively isolated after 2.5 years of analysis, and organic lemons also grown on the property. We’re still somewhat in awe of what Max achieved, given we’d been told plenty of times that the whole concept of an Estate beer was optimistic at best. Other have succeeded in accomplishing certain elements of the plan, most typically growing their own hops, but were fortunate, passionate and proud to be one of a handful of breweries from across the brewing landscape that have harnessed and completed the goal we set out to achieve from the beginning.